There are few things in life as special or as meaningful as dog ownership. They’re with us for such a short period of time, but what they give us in return is immeasurable—and timeless—and is never forgotten. Every canine breed is interesting and distinct in its own right, but there’s something inherently magical and wondrous about Labrador retrievers that make them seem the perfect American family dog. This is the story of three black Labrador retrievers who helped shape and define my family’s very identity over the course of three decades. 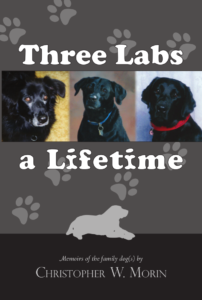 Included are stories and anecdotes—some amusing, others sad—chronicling the lives of these three exceptional dogs as recalled from my memory and past personal experiences. Portland, Maine. He received a BA in Journalism from the University of Maine at Orono. He is a history enthusiast and has enjoyed creative writing ever since penning his first short story back in second grade. Along with this work of nonfiction, he is also the author of three fictional tales titled A Tale of Life & War, The Besieged, and The Rebel’s Wrath.